Have you heard of Gousto the meal kit delivery service? Or perhaps you have heard of Gousto but weren’t quite sure what they were all about. Well from a weekly changing, chef created menu, you can choose up to 4 dishes and then the ingredients along with step by step recipes cards arrive in a box to your door. The food comes insulated in Woolcool with plenty of disposable ice packs so there’s no need to worry if you’re not in when it arrives! Cooking with Gousto is like painting by numbers and takes away all the hassle of shopping and menu planning. You choose whether you want a box for 2 or 4 people and there are plenty of options for vegetarians. 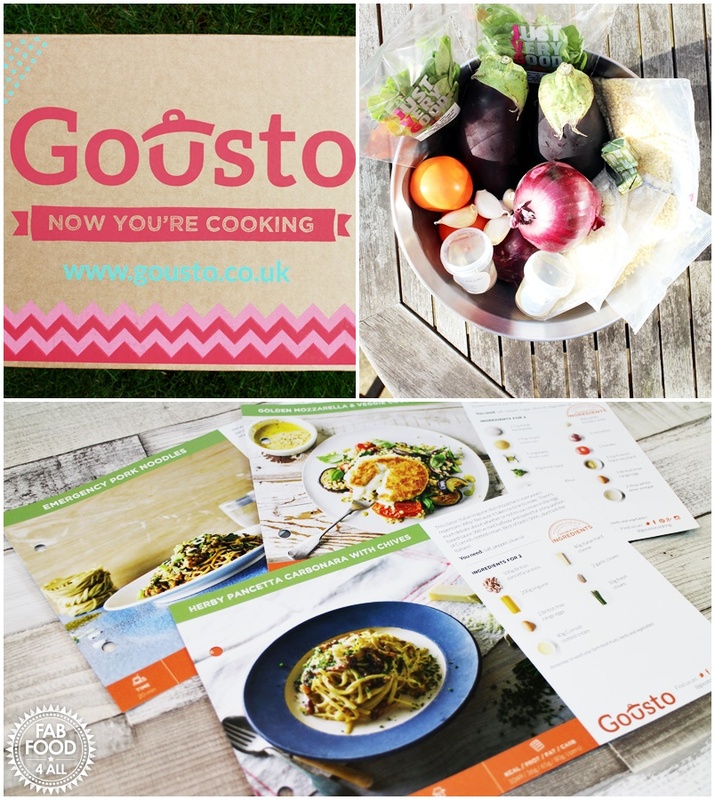 Last week Gousto send me a box to try out which was a real blessing as having just had a virus I wasn’t feeling up to going shopping let alone planning any meals so it was perfect timing, I just had to turn up in the kitchen and follow the instructions to create delicious meals. I chose some of their quicker dishes which were: Emergency Pork Noodles, Herby Pancetta Carbonara with Chives and Golden Mozzarella & Veggie Couscous which was our favourite dish so am sharing it with you today! Emergency Pork Noodles (bottom left) Herby Pancetta Carbonara with Chives (top right). Gousto measure out all the ingredients for you so you save time not having to weigh or measure anything out; you might just have to add some cooking oil or flour to the dishes which everyone has in their kitchen. All the ingredients are top quality, they use high welfare British meat and where possible organic vegetables.. The really good thing about having the recipe cards is that when you have a meal you really love then you can just make it again buying your own ingredients. How often have you gone out to buy special ingredients for a recipe only to find they languish in a drawer or cupboard because no-one actually liked the recipe? I’ve been there and it’s such a waste but with Gousto you will know that you already like the recipe so any special ingredients won’t be wasted. 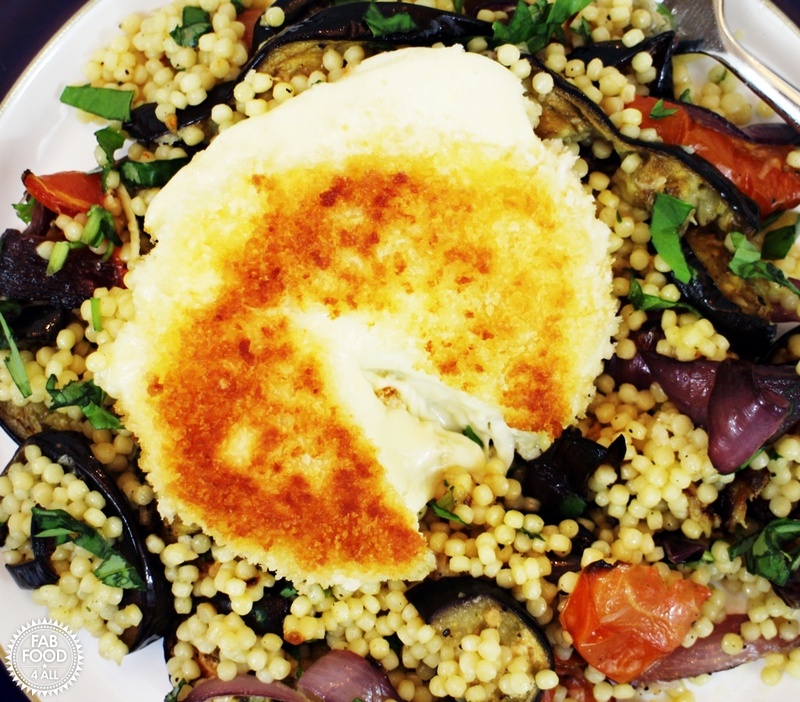 So back to the Golden Mozzarella & Veggie Couscous which I’ll let Gousto introduce: “Giant couscous, also know as ‘Israeli couscous’ is mixed with warm roasted vegetables, fresh basil & a punchy garlic dressing. Learn how to ‘pane’ the mozzarella, which means coating in breadcrumbs & pan frying it for a melty inside and crispy exterior”. 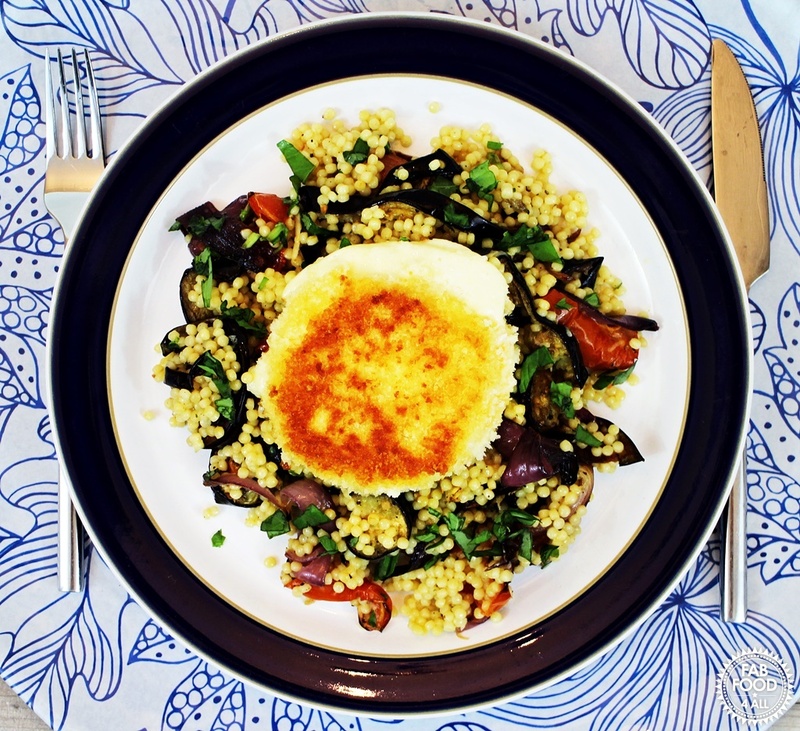 We all really enjoyed this dish although hubby said I could have held back some of the dressing as he found it a bit much so I’d say add it slowly to gauge how much you need for a fine coating on the couscous. If you’d like to have a break from shopping and meal planning then why not use this discount code COOK25 to get up to £25 off your first order! What are you waiting for? Bon appetite! NB: This is a commissioned post for Gousto and all opinions are my own. 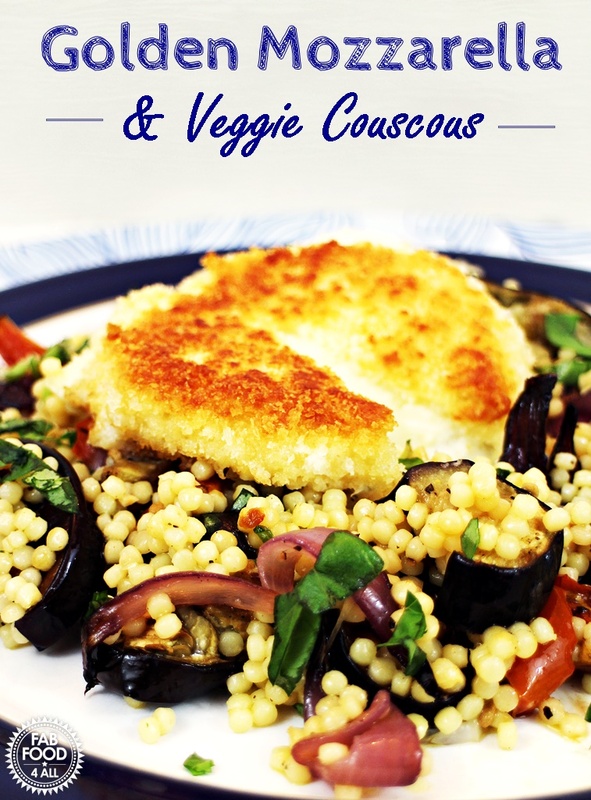 Giant couscous, also know as 'Israeli couscous' is mixed with warm roasted vegetables, fresh basil & a punchy garlic dressing for a super tasty meal. Preheat the oven to 220ºC/ 200ºC (fan)/ 425ºF/ Gas 7. Cut the mozzarella in half (like you would a burger bun). Pat dry with kitchen paper, then set aside. Cut the aubergine in half lengthways then chop into thick slices. Peel and cut the red onion into quarters. Drizzle with olive oil and season generously with salt and pepper. Put them in the oven for 25 minutes of until the vegetables are tender and coloured. Meanwhile dissolve the stock cube in a pot with 600ml boiled water, then bring to the boil over a high heat. Add the couscous and cook for 5 – 8 minutes or until cooked with a slight bite. Meanwhile, peel and finely chop (or grate) the garlic. Combine the garlic, Dijon, vinegar, ½ tsp sugar and 2 tbsp olive oil. Season generously with salt and pepper and mix, this is your dressing. Chop the basil finely, including the stalks. Add the breadcrumbs to one plate, cornflour to another and beat the egg in a shallow dish. Coat the mozzarella discs in the cornflour first, then the egg, then the breadcrumbs. Coat the mozzarella for a second time in the egg, then the breadcrumbs coating every side completely. Heat a pan with 2 tbsp vegetable oil. Once hot, add the breaded mozzarella and cook over a high heat on each side for 30 – 60 seconds until starting to turn golden. 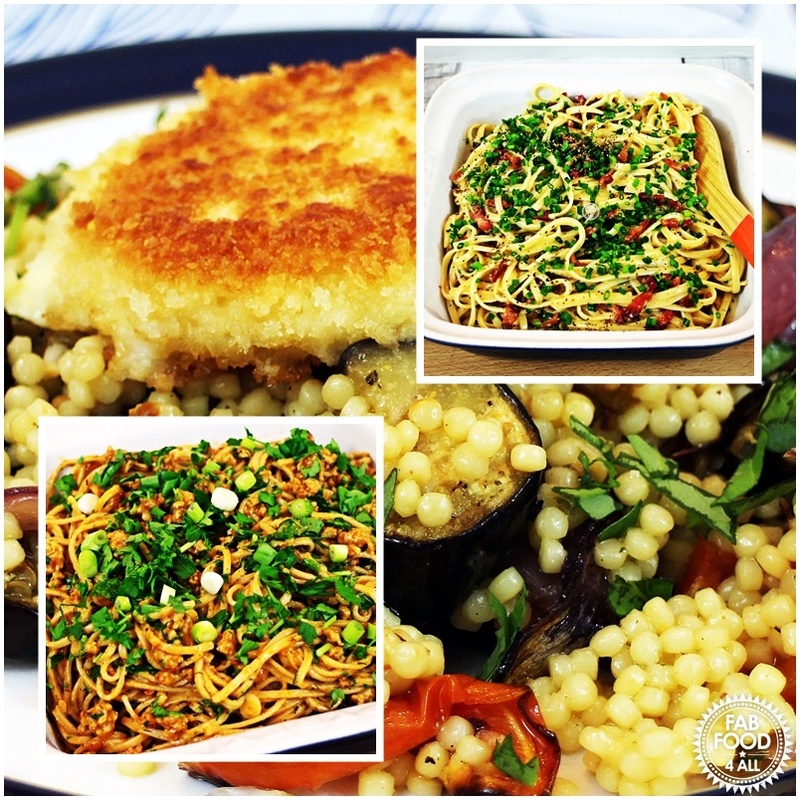 Combine the roasted vegetables with the drained couscous, dressing and chopped basil. 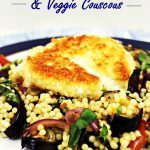 Serve the crispy mozzarella over the couscous. Gousto do some great dishes. I’ve been doing it for the last month! Looks lovely and very healthy too!